The first week back at work went slowly. The world has been white and cold. Customers tend to stay home in this weather. The first few inches were beautiful and quiet. I like walking in fresh snow. Now we have about 10". We need some snow removal. The bad weather has meant a little more knitting time. I've started a stealth sweater, so there won't be a lot of other knitting to show. I do have a couple of things finished. 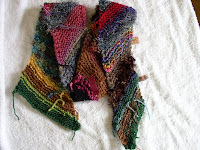 A scrap scarf in garter stitch. Use 3-5 yards of each yarn on 25-30 stitches. Row 1: k1, k2tog, k to 1 st before end, inc. 1, k1. Row 2: k. Repeat. Leave all tails. This was fun, I think I'll do another one, but longer. I'm knitting more birthday socks. 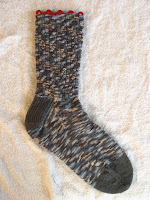 The Ravelry SKA group has a January option of socks from an online magazine. That fit my need for grandson socks, so I'm doing Widdershins from Knitty Summer 2006. I made a number of changes to fit the target foot, but one is finished. My November SKA sock entry won me a skein of sock yarn called Chewy Spaghetti. That was the pair of socks that has the cuff redone and I ran out of yarn twice. Winners are picked by random number from the finished socks. I knit some swatches of new yarns for the TNNA trade show. I sent pictures of the swatches to the yarn companies, and one of them wants me to knit socks for them. They are coming out with a new solid color sock yarn. My stealth project is for another yarn company. The swatch is done and washed. I can start this tonight. I want to get farther on the sock first. Dinner is cooked already, it's black bean soup. I just need to add the tomatoes, heat up and eat. I like easy dinners! The extra will go in the freezer for future meals.